discount on Russian Natural Gas. McCain was the guest star of the Euromaidan. 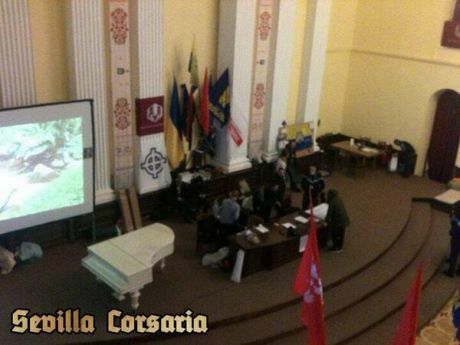 Kyiv City Hall, occupied by the Ukrainian opposition led by Svoboda and turned into their “Revolutionary HQs”. The cross in the circle is a neo-nazi symbol. City Hall of Kyiv which they occupied earlier in December. Yatseniuk, or for the leader of Svoboda, Oleh Tyahnybok (or maybe for Tymoshenko for whose release from prison, the West makes huge pressures). elections, a month before the Euromaidan. which failed to call for early elections for the mayor of Kiev, which would have led to the ousting of one of the allies of President Viktor Yanukovich from a powerful post. attendees as well as the capital. Is this another not so colourful revolution? Good article above. This has all the hallmarks of another color revolution but it may turn out to be tinged red by people's blood. Definitely a fascist element to it. At least three protesters died yesterday when police moved in with tear gas and clubs to clear hundreds of demonstrators lodged behind barricades close to Kiev’s Independence Square. One of the victims was a 30-year-old man who is alleged to have been shot four times by riot police. Medical staff also reported two other fatalities. Following reports of the deaths, Ukrainian Prime Minister Mykola Azarov denounced the demonstrators as terrorists and provocateurs whose “criminal” actions would be punished. One group particularly active in the street fighting around Independence Square is the ultra-right nationalist Right Sector, a coalition of right-wing organizations and supporters of local soccer clubs. In a statement on Monday, the group claimed credit for the violent confrontations with police on Sunday and pledged to continue its activities until President Yanukovych resigned. Lavrov was referring to the interventions in December by EU foreign policy chief Catherine Ashton and then-German Foreign Minister Guido Westerwelle who openly expressed their solidarity with demonstrators. EU incursions on behalf of the opposition were supported by Washington. US Senator John McCain addressed a mass rally in Independence Square and dined with leaders of the opposition parties, including Oleh Tyahnybok, the leader of the ultra-right and anti-Semitic Svoboda party. resistance of the EU superstate is futile..
Resistance of the EU superstate is futile,these Eurocrats are salivating at the prospect of ripping the Ukraine apart,in will come abortion,euthanasia following dodgy insurance policies,and uncontrolled waves of mass immigration into the country. Divide and conquer is how the Eurocrats play the game,if everybody is divided,well nobody can mobilise against the offending government can they? RT have an series of photos showing the weapons and armor being used by the rioters in Kiev. They don't look that peaceful. If protestors were using the same gear in Europe or US they would be locked up and massive force would be used against them. But in this case ex-president candidate John McCain rushes out to meet with these people. The timing of all this looks like it is designed to ruin Putin's high profile Winter Olympics which start in Sochi in two weeks times and to punish Russia for daring to back Assad in Syria against the Western backed terrorists who have killed thousands there and who now in the face of defeat, largely due to Russia blocking any UN backed invasions; have now come to the negotiation table even though they are screaming Assad should go. People might also remember that in 2008 during the Chinese Olympics when the worlds press were focus on it, Putin had to leave early to rush back and deal with the Georgian invasion of South Ossetia by the neo-liberal Saakashvili the US puppet. He had been armed and very strongly encouraged by the USA and Israeli to carry out this attack which began by shelling sleeping residents in their apartment blocks. There is also another angle to this which is that Gazprom holds a near monopoly on natural gas in these region of the world and the Ukraine is a major transit point for gas pipelines to Europe. The US and EU would like to break this power (along with Russia) as control of energy is key to the strength of Russia. Indeed before Putin came to power he wrote a thesis on how to rebuild Russia after the disasters of neo-liberalism and Yeltsin which almost resulted in the country breaking up in dozens of statelets. This had been the strategic aim of the US-Anglo Saxon arm of the capitalist powers because had it been broken up, it would have been easy to keep that apart through a strategy of divide and conquer as they would have backed numerous barbaric dictators. Separately none of them, once divided and constantly monitored, would never have been able to have the power and resources for the Russian state to re-emerge. The prize would have been to remove perhaps the key global opponent to US hegemony because had it happened it would have been far far easier to surround China and grind it down. Right-wing, pro-Western opposition forces in Ukraine pushed the country one step closer to all-out civil war yesterday, rejecting President Viktor Yanukovych’s proposed concessions and demanding that he step down. The opposition aims to install a far-right administration pledged to implement the austerity policies of the European Union (EU) and International Monetary Fund. On Saturday, President Viktor Yanukovych had declared that he was prepared to make a number of concessions, following months of protests and escalating repression and the passage of an anti-democratic anti-protest law. Yanukovych proposed to appoint two leaders of the opposition, Arseniy Yatsenyuk and Vitali Klitschko, to the posts of prime minister and deputy prime minister respectively. Yatsenyuk is a leader of the Batkivshchyna (Homeland) party, led by the imprisoned oligarch Julia Tymoshenko. A former head of the National Bank of Ukraine and foreign minister under the previous President Viktor Yushchenko, he is a firm advocate of the austerity policies demanded by the EU and IMF. Former boxer Vitali Klitschko is the head of the Ukrainian Democratic Alliance—a creation of German Chancellor Angela Merkel’s Christian Democratic Union (CDU) and its think tank, the Konrad Adenauer Foundation. This week, Klitschko vehemently defended his collaboration with the third main party in the opposition coalition, the neo-fascist Svoboda party led by ultra-nationalist Oleh Tyahnybok, in an interview with the Guardian newspaper. On Saturday evening, Klitschko told a crowd gathered in Kyiv's central Independence Square that the opposition coalition of parties rejected the offer of concessions from the government. 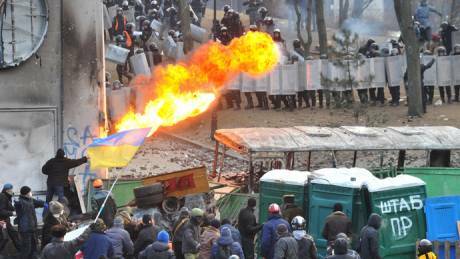 He urged the crowd to continue demonstrating until President Viktor Yanukovych stood down. Already last Wednesday, Klitschko had called for a stepping up of the protests against the Yanukovych government. He has also signaled that the protesters might try to kill top government officials, tweeting: “Viktor Yanukovych, do not go down the same road as Ceausescu and Gaddafi”—referring to Romanian Stalinist dictator Nikolai Ceausescu, who was murdered during the restoration of capitalism in Romania in 1989, and Libyan dictator Muammar Gaddafi, murdered in 2011 at the end of the NATO war in Libya. His renewed call for regime change on Saturday came as more evidence emerged of the role played by neo-fascist paramilitary organizations in violent confrontations in Kyiv and throughout the country. Anti-government protesters are reported to have occupied local authority buildings in at least nine regions of the country. Hundreds stormed a municipal building in the city of Vinnytsia, nearly 200 kilometres southwest of the capital. Similar attempts have been reported on Saturday at Poltava to the east of Kyiv, and at Chernigov to the north, near the border with Belarus. In the western city of Lviv, a traditional stronghold of ultra-nationalist forces, protesters have been occupying local government offices since last week. According to a Channel 4 News report, the Right Sector group comprised of “autonomous nationalists,” which recruits from ultra-right football hooligan groups, are in the front line of confrontations with the police. Some 500 Right Sector militants are reportedly inside the government buildings seized by protesters. Also prominent in the demonstrations are paramilitaries from the Patriot of Ukraine group, the former paramilitary wing of Svoboda. Its thugs are featured on photos from recent protests, armed with chains and bricks and sporting fascist symbols on their shields. The direct intervention by leading representatives of the EU, Germany and the US in the Ukrainian protests threatens to split the country in two and provoke a civil war. Top US and EU officials such as US Senator John McCain and German EU parliamentarian Elmar Brok have visited the Ukrainian protesters and endorsed their campaign against the government. And now ask yourself this? Would this sort of thing be allowed to happen on the streets in the US, Britain or Germany. The answer is plainly NO and they would have been swiftly dealt with long before it got this far and anyone who went as far as publically supporting such behaviour would have first found themselves savaged by the press and then promptly receiving long prison sentences. This interview with a comrade from the Autonomous Workers' Union in Kiev was done on January 28, 2014. It sheds some light on the events around the Maidan: the array of reasons behind the protests, their focus on the hated president, the differences to the "orange revolution", the role of the right, the weakness of social struggles and possible scenarios. RT carries an interview of a ex-CIA and FBI agent where they say in the same circumstance as the rioting in Ukraine, US police officers would have used deadly force.